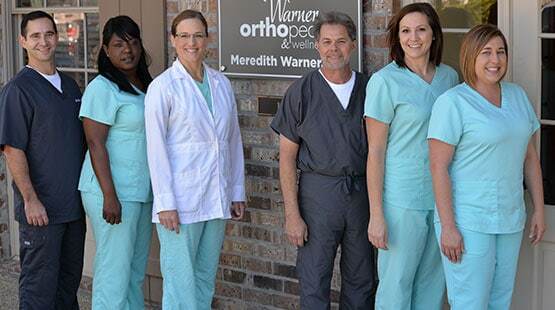 As an orthopedic surgeon and Baton Rouge foot and ankle doctor, Dr. Meredith Warner has an extensive medical background and training, allowing her to handle more advanced, complex cases to provide her patients the quickest route to recovery. Everything in the body is linked together, and the cause of your pain may actually originate from other seemingly-unrelated areas in your body. Pain in your foot could be caused by limited rotation in your hip. Burning pain in your thigh may be a result of a pinched nerve in your back. Rather focusing on one particular part of the body or a specific injury, Dr. Warner develops a comprehensive, total musculoskeletal plan for each of her patients based on their individual condition and past medical history. She explores all avenues before recommending surgery, and when surgery is necessary, she makes the operation as non-invasive and painless as possible. Dr. Warner offers convenient appointments and short wait times, so you can be back on your feet in no time. She coordinates directly with your primary caregiver and even offers in-home X-rays, ensuring your experience is pleasant and seamless. When Dr. Meredith Warner began building her practice in Baton Rouge, Louisiana, she would consistently ask herself – “Is this a place I would feel comfortable bringing my mother to?” This question continues to resonate in her mind every day as she strives to create a welcoming environment that offers respectful, compassionate and personalized care for each of her patients seeking orthopedic care. Personalized patient care is what sets Warner Orthopedics and Wellness apart. When you visit our clinic you can expect to receive world class care. Knowledgeable physician specialist, physical therapy and caring clinical staff provide you with an exceptional health care experience. Medicine is often called an ‘art not a science’. This statement is true in one respect and false in another. The artfulness of medicine takes place when a physician interacts with a patient. Unless there is mindfulness on the physician’s part and the ability to pause and observe the patient, a lot will be missed. This is similar to going to an art gallery and spending enough time to really appreciate the works, as opposed to rushing through a slide show if images of art. Modern clinical medicine is more like the latter, while at our clinic we strive to be more like the former. When I started Warner Orthopedics and Wellness, my primary concerns were the patient’s experience and comfort along with making the correct diagnosis, taking the entire patient into account and providing the best treatment. It is impossible to achieve these goals unless one has the time to really talk with a patient. It is also impossible to achieve these goals unless one actually examines a patient and really spends time looking at all of the diagnostic studies. It is equally impossible to provide the highest quality care unless one is willing to continually question the status quo, read and learn. In most clinics in Baton Rouge community, a single physician will see around 50 patients each day. In an 8-hour day, that means that each individual person, no matter what their personal pain and experience may be, is allowed to have exactly 9.6 minutes of the physician’s time. However, those 9.6 minutes assumes that the physician is not looking at imaging, not doing paperwork or charting and takes no phone calls or other interruptions during the clinic day. Obviously, anyone that has been at a doctor’s office knows that this is never the case. Taking all of the daily nuances of modern medicine into account then, most clinicians may only spend about 6 minutes with a patient. In addition, it is rare to find a doctor willing to step outside of their habits and to learn new skills and techniques; doing so slows down a 50-60 person daily clinic. In my opinion, 6 minutes is not enough time to spend with the patient. To truly appreciate a patient and understand his or her problem and its impact on their body and life, you must ask questions, listen, examine the patient and then ask more questions and listen even more. At Warner Orthopedics and Wellness, I have limited the number of patients to be seen each day so that I can spend an appropriate amount of time with each patient. Medicine should be treated more as a science and less as a business. Scientific study requires a great deal of knowledge, continuing education and the simple abilities to observe, listen and think. At our clinic, each member of the clinical team works to ensure that wait times are minimized and that the patient experience is maximized. At Warner Orthopedics and Wellness, we promise to do everything we can to make the correct diagnose and to offer the best treatment possible; even if we must refer you to a different provider. We treat every one of our patients as though he or she were one of our parents.